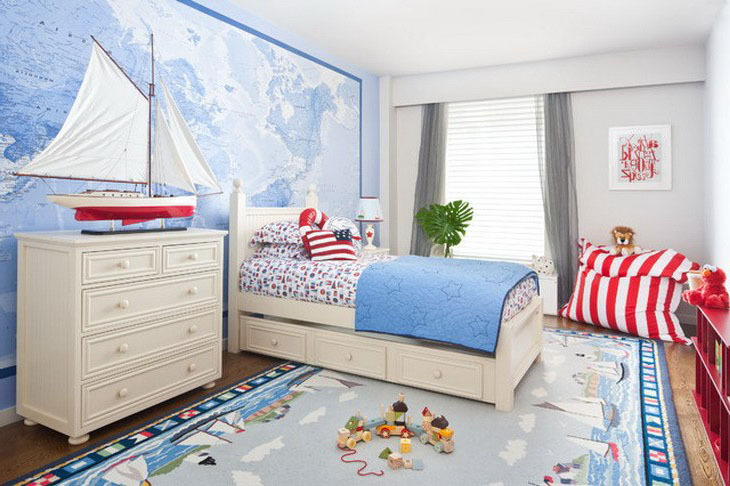 How to design kid’s bedroom for a boy? Having a child in the family – it is very responsible. Taking care of them requires a lot of money as well as time and love. Which design is the most suitable for a kid’s room for the boys? While baby boy is in the womb, this question is not so actual. But taking care of a child begins from the moment when you find out you are pregnant. The mother begins to think about it in the early period of pregnancy, although there is still the 9 months waiting period! You will do a lot of shopping when getting prepared for this happy moment. 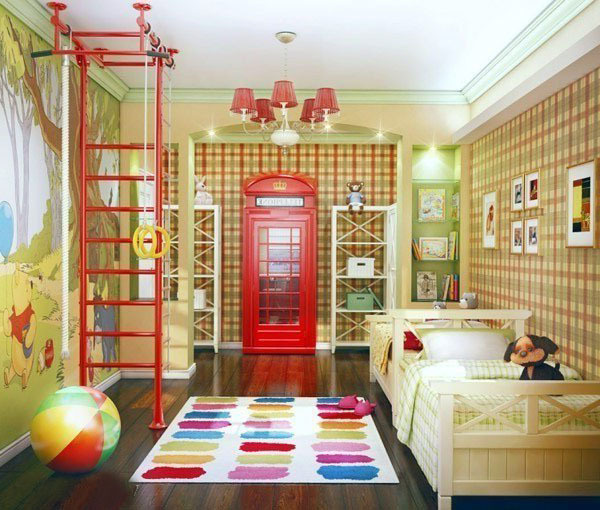 And of course then you will be thinking and generating ideas about kid’s room decoration for your baby. Generally, there’s nothing complicated here, however you need to take into account and apply specific knowledge in order to create a perfect room for your boy. Now we will have a look in more detail this question and fully answer the question “How to make a nursery for a boy?”. For beginners, you need to understand the main idea that the kid’s room is a place where your boy will spend most of his time. This means that you will have to create in your room, a small world, where he will feel very comfortable, the atmosphere must contain the spirit of peace and security. It is a fact proved long ago that the way is nursery is decorated and designed, may significantly affect the child’s development. That is why you need to fully and seriously dedicate yourself to this question. First of all, you need to think about the materials of the furniture and other room elements you will use. Let’s start from the baby bedding crib. 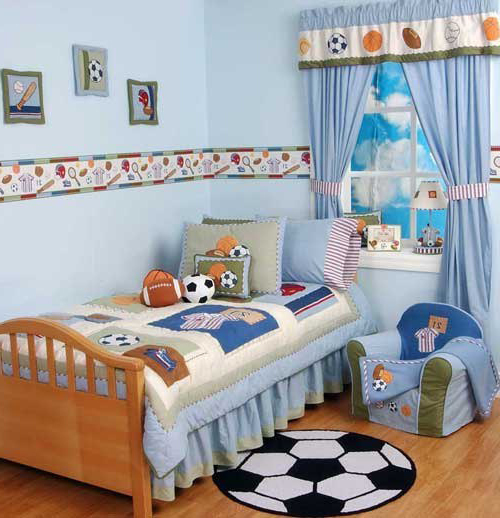 Your baby boy bedding needs to be comfortable and perfectly safe. All the modern standards recommend that you put all the soft elements such as pillows and so on out of your baby crib until your boy is more than 2 years old. Flooring should be appropriate for your boy’s bedroom. The material must withstand the shock, tumbling, jumping and children running around. It is better to use natural wood flooring. If it is too expensive, then a cheaper option could be a laminate. It has beautiful visual characteristics, it is anti-static. You need to take into account the fact that the floor is quite slippery, and boys, having fun and running can seriously injure themselves. That is why we advise you to lay carpet in the nursery, with a short nap. It will be easy to clean, it is anti-static, and it does not fade in the sun. You need to choose a carpet in such a way to best fit into the whole design of your boy’s room, because our main aim and idea is to make beautiful design. You can paint the walls in the kid’s room and use wallpaper. In the first case, you will have a lot of opportunities in terms of creativity. Paint on the walls what you want and how you want. As we make room for the boy, then it is worth to draw cars, or cartoon characters or use wall letters. And in addition you may use paint with the possibility of washing – if the child draws something on the wall, the only thing you need to do is paint something over it or wash it off with water. What’s about wallpaper? Nowadays there are options with the possibility of washing. And you have a wide range of wallpapers to choose. At the moment, the market presents a huge variety of kids’ wallpaper with the characters from cartoons and other interesting patterns and colors. 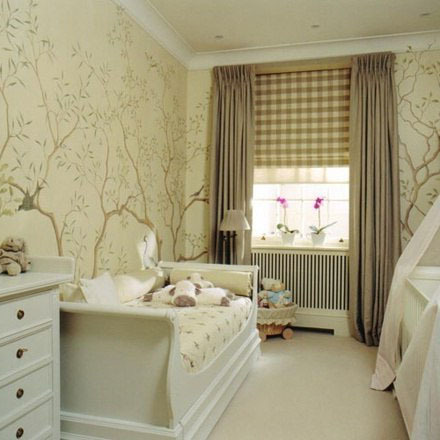 Curtains are playing a big role the design of the boy’s bedroom. Depending on which side your windows come out, you’ll have to pick density materials. If the windows are located on the sunny side, then shutters would be the best option that completely shut down the room from sunlight. Do not forget about design. Choose something beautiful to make your boy happy with his room. As the main source of overhead lighting, you can take a regular chandelier. There is only a small exception: you should take such a chandelier that does not use an open-work glass or crystal, because the glare that will be produced by them may make harm for your boy’s vision. The lighting should fall evenly, and be gentle. Such light is ideally provided by a large flat bowl placed in the center of the ceiling. Optionally, you can embed ceiling with halogen lamps, which give adequate lighting. Do not forget, about night table lamp, preferably with adjustable brightness and lamp shades, which should be located above the baby bed. The atmosphere in the nursery for your boy will also depend on what color you will choose. Correctly choose the color palette. For example, it is known that children aged between four and six years old, prefer bright colors, like pink, red and purple. 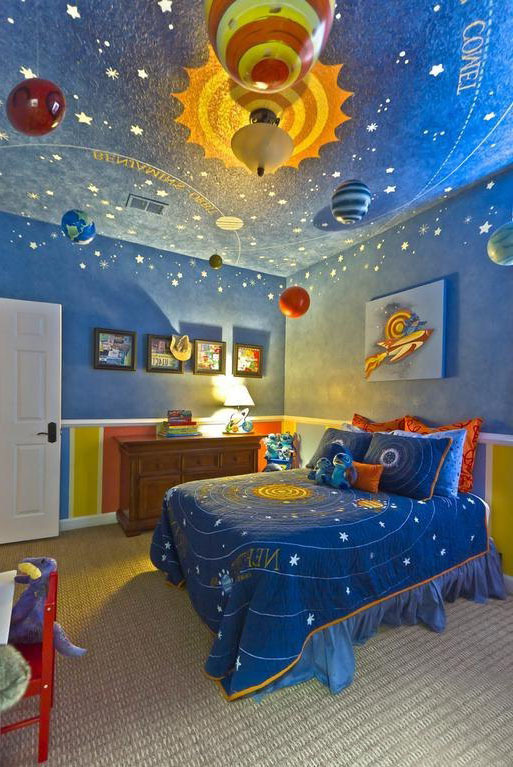 Boy’s room can be decorated by combining all these colors, but the main thing is not to overdo it. We need to get the balance and chime. The overabundance of bright colors can make baby boys tired. Optionally, you can combine some dull or neutral color tones – and as the result you should get the better color design scheme. In this case the colors for ceiling, floor and walls, should have be a bit lighter – you can use white, blue, gray color tones and so on. If the baby boy is not born yet, you will have to do everything at random, guided by rules of color combinations, taking into account the practicality of the materials used. 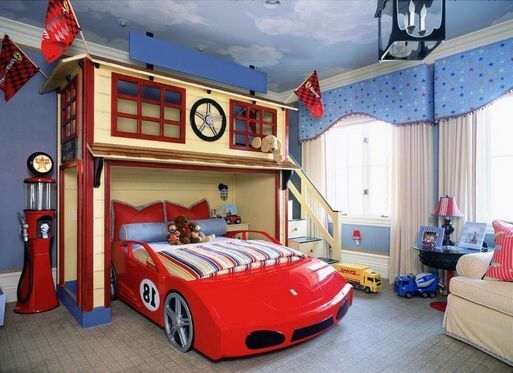 But when your little boy grows up, he will clearly express his opinion and ideas about his room design. In that case, you may have to radically change the whole concept. When you do this, listen to your boy’s wishes and select colors depending on its nature and character. 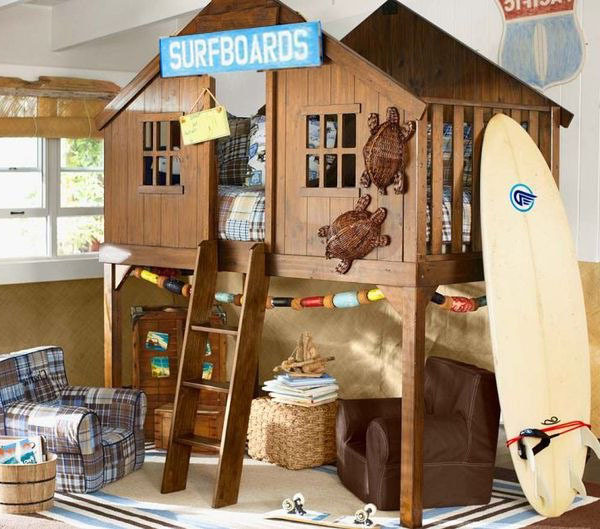 Posted on August 28, 2013 August 29, 2013 Categories Kids Rooms IdeasLeave a comment on How to design kid’s bedroom for a boy? Very often it is really too complicated to choose the right handbag or jacket for your teenage girl, not to mention how to create the perfect teen girl room design. Most teenagers use to think they are adult enough to make important decisions by their own that is why it is worth to discuss the room decoration ideas with them at first. Roughly, all the teen girls can be divided into two separate groups. One loves romantic tones and atmosphere, light colors and style. The other will prefer restraint and boys’ design. 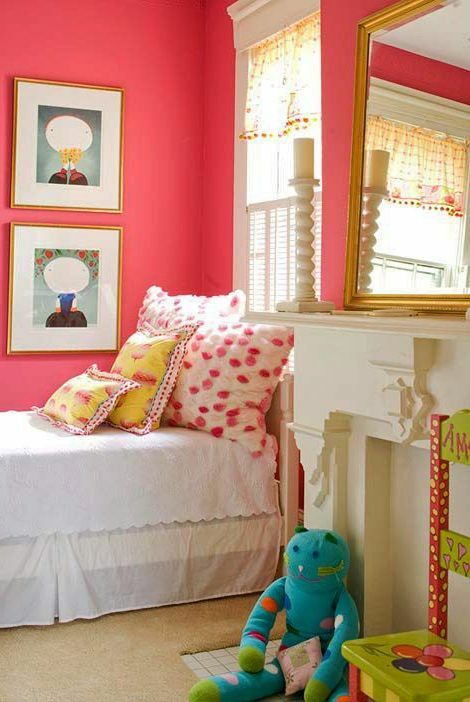 Stay focused on interests of your little girl when designing their own living space. Bring in the interior all the items and accessories that she will like. No matter what it is, pictures with movie heroes, Hello kitty muzzle, posters of rock bands or dogs photos, etc. Any of these elements can be properly fit almost any decor. The main point here is to choose the right core concept. Start with discussing design ideas for your teenage girl room with her and try to select the option that will suit both of you. 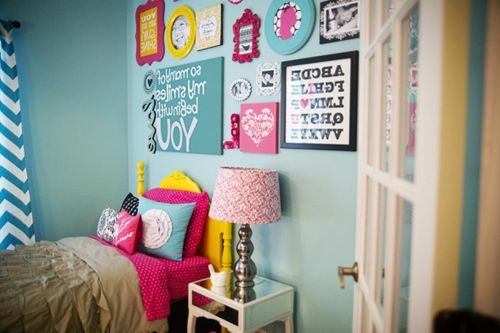 Below are beautiful teen girl bedroom ideas you need to take into account when designing the perfect sleep and study room space for your daughter. The perfect choice for teen girl would be optimal multi-functional furniture that is can be easily transformed and moved, and what is most important does not occupy too much of room space area. 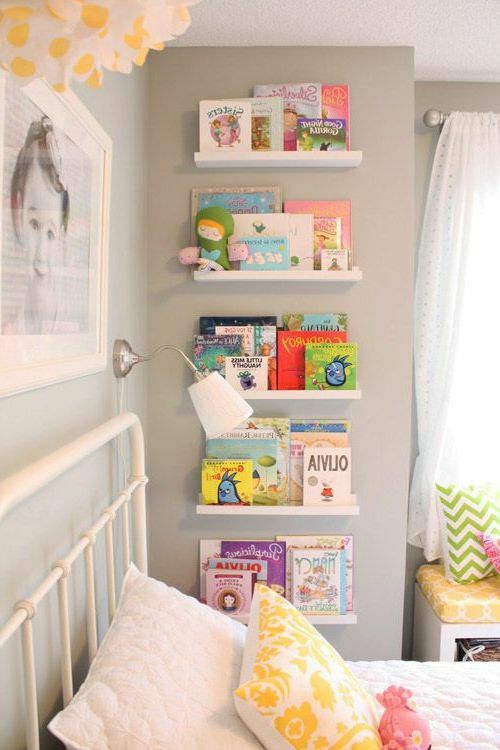 To keep things in the bedroom simple, you can use shelving, through which it is possible to divide room space on zones. Girls used to fill up shelves with the most valuable items for them (boxes, vases, souvenirs, picture within etc.). But do not get the room too cluttered up with unnecessary racks, cabinets and other furniture elements, let it be fresh and airy. High-quality interior room for a girl – is a firework of imagination and original and creative solutions, do not be afraid to experiment! 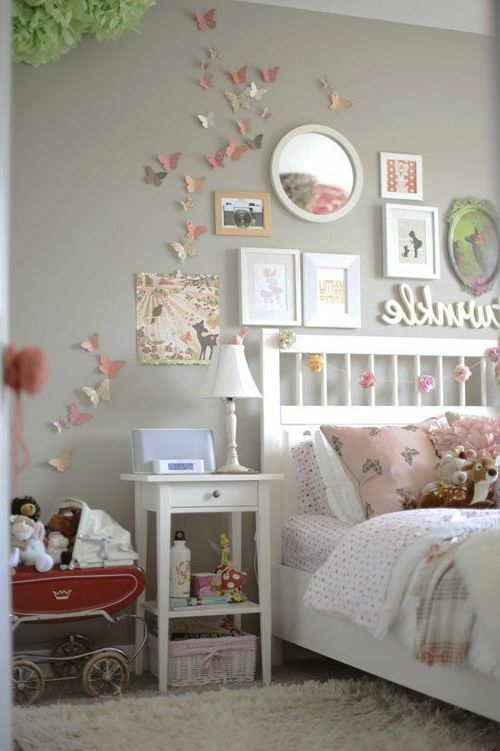 Maison stylish beds ideally can fit in the girl’s room interior design. Beds in girls’ bedrooms are the main attribute. In this example we are presenting ideas on how to create a classic and comfortable look for teenage girl’s bed using beadboard paneling on each end. 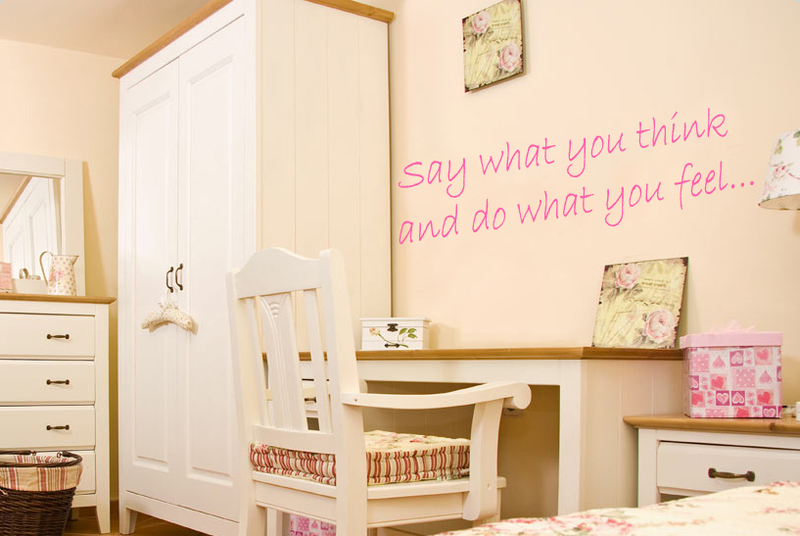 One of the most creative ideas for teen girl room could be decoration with walls letters, words and sentences, quotes of well-known people and celebrities. This beautiful décor idea is for romantic natures that, frankly speaking, most teens are. 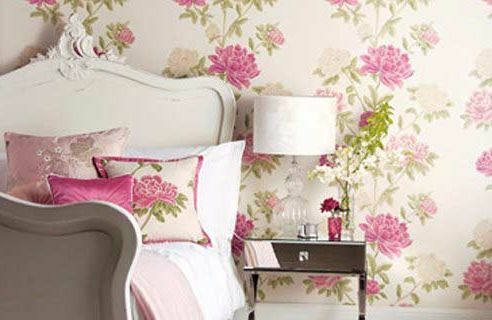 You can bring the country garden spirit into your room and emphasize your character by adding girl’s favorite flowers as the pattern image for wallpaper or combining and decorating the bedroom interior with real natural flowers. It is a big pleasure to sleep in such a floral bedroom and generally live, study, relax and get fun there. 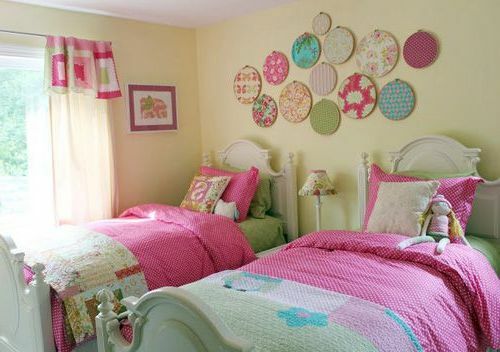 Have a look at the following pictures of floral teen girl bedroom ideas and get your perfect inspiration! Mixing and matching your ideas can help you create your own custom design that reflects girls’ individual style and personality. Adding different, even opposite layers of patterns into bedding expands the horizons of bedroom interior design. 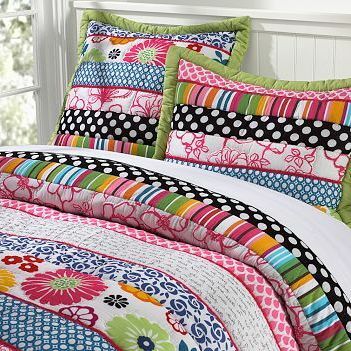 Mix and match bedding from solids, stripes, prints and quilted elements. 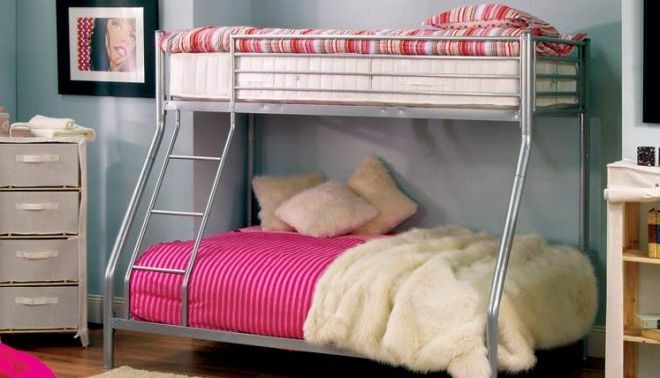 In case you have tweens, supposing they love pillows throws and all this crazy things, you definitely will need to have bunk beds in the room space design; it will save space and bring the fun feeling to your daughters. Wardrobe Design: 8 wonderful ideas to inspire you! A couple of centuries ago there was a rule how to design a good sized wardrobe: it was a “rule of eight men”, meaning the wardrobe should be capable to include 8 small men inside it, pretty big right? Only in the 19th century wardrobe design has began to obtain its current look and size, but perhaps it still could be the largest element in your room furniture. See below 8 inspirational design ideas you may consider while thinking about and creating aesthetically pleasing wardrobe that will most effectively serve your needs in every-day life. 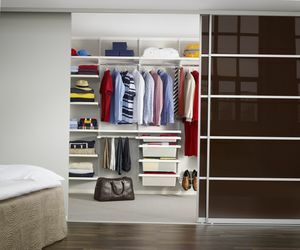 Nowadays evolved modern wardrobe design is usually and firstly associated with central sliding doors, carried to the floor, covering racks and drawers. 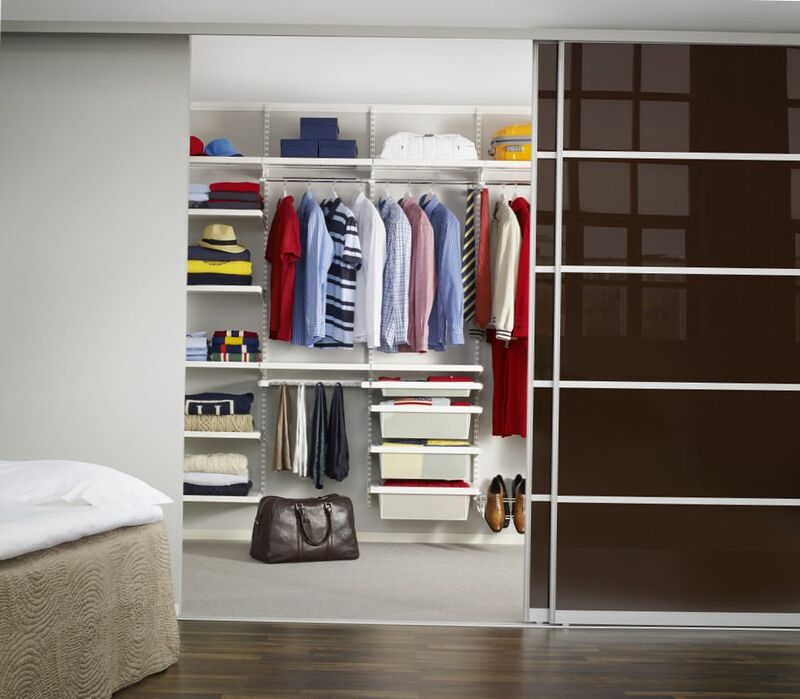 Sliding wardrobe doors can help you to create a wonderful and space effective storage solution for any interior. And it goes without saying it will introduce a clean, compact and fashionable style to any room setting that finally look amazing. 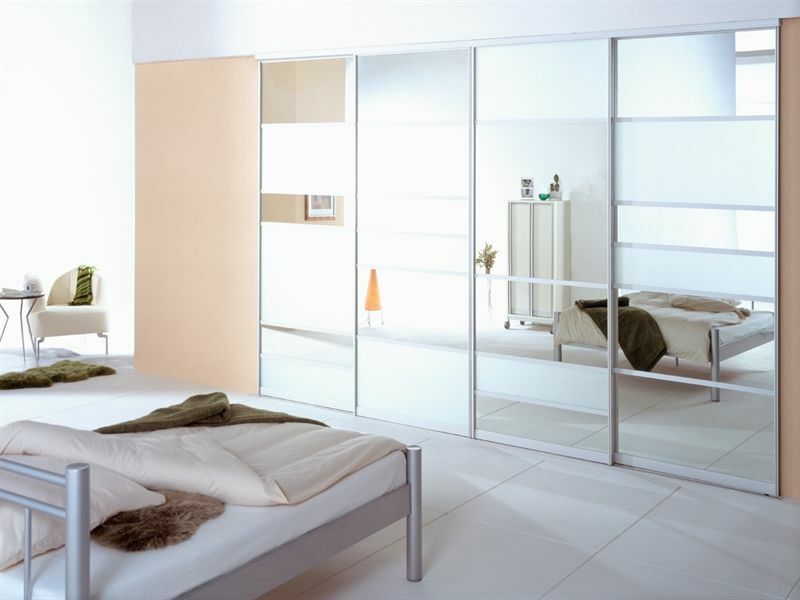 Such impressive wardrobes solutions may consider mirror on all the sides of the furniture. 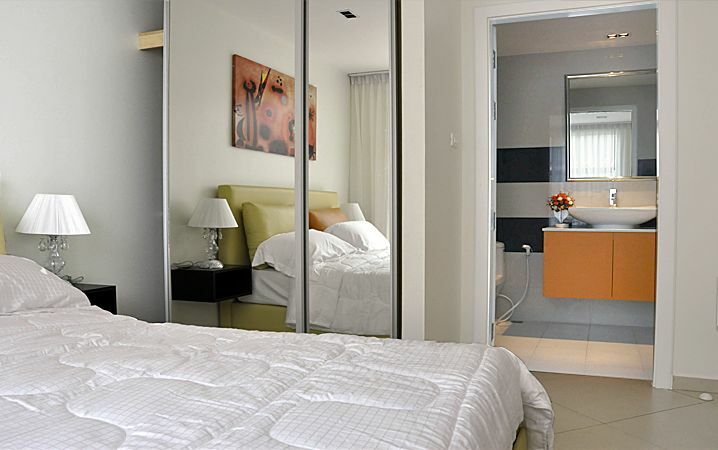 Mirrored sliding wardrobe door is useful because it gives you a full-length mirror and also makes the room space light and unlimited. 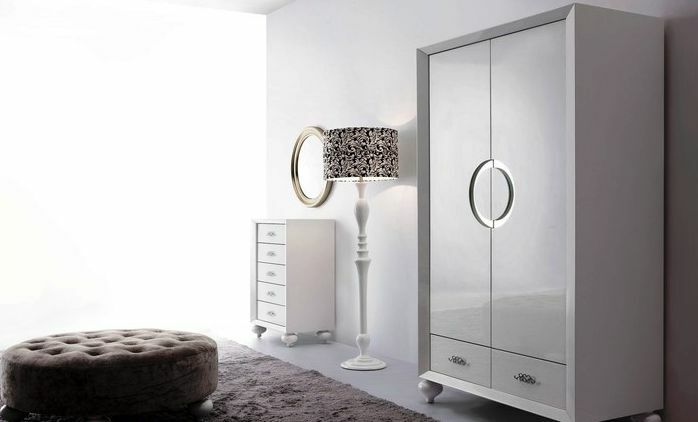 The contemporary look of wardrobe is achieved by delivering clean simple lines, that together with fab furnish wood materials, glass and mirror adds stunning modern space effect to the whole design. Combining the most pleasant and relevant colours, lighting, materials and designs, you can achieve an inspirational wardrobe design which will fit any modern living room, bedroom or any other space. Traditional design has beauty of older style. It has become trustworthy over the years and proved its capability and long-lasting facility. Did you know that traditional wardrobe is a cabinet used for clothing storage? A smaller one used for different accessories is often called a chest of drawers. Traditional one is a wooden and hand-made designed wardrobe, usually with two or three doors. Cabinet is a bit broader concept, being a box-shaped furniture element, used for storing various types of items inside it. 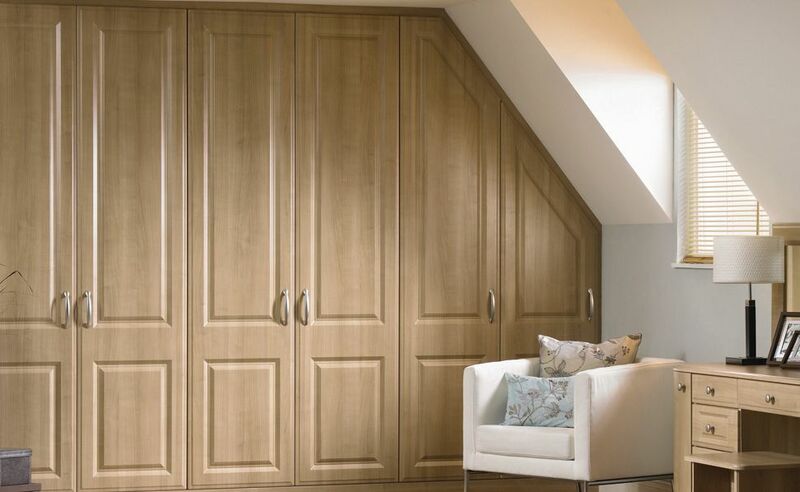 It goes without saying wooden wardrobes work for any kind of home space – either for living room, kitchen or bedroom. 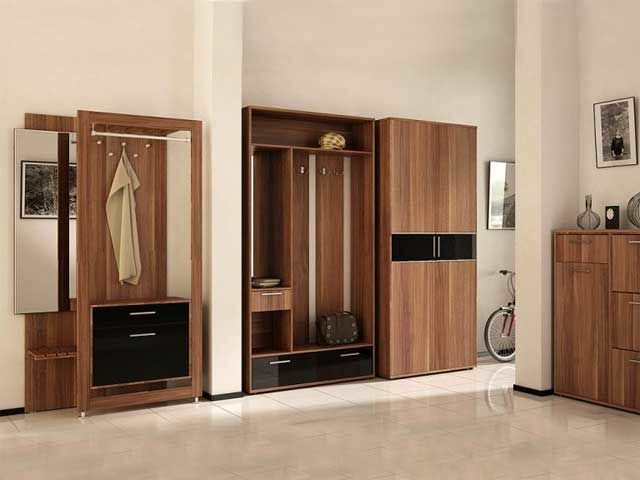 Wood is perfect material choice for wardrobe. First of all because of its amazing long-lasting features and ecological characteristics that is good for your health. 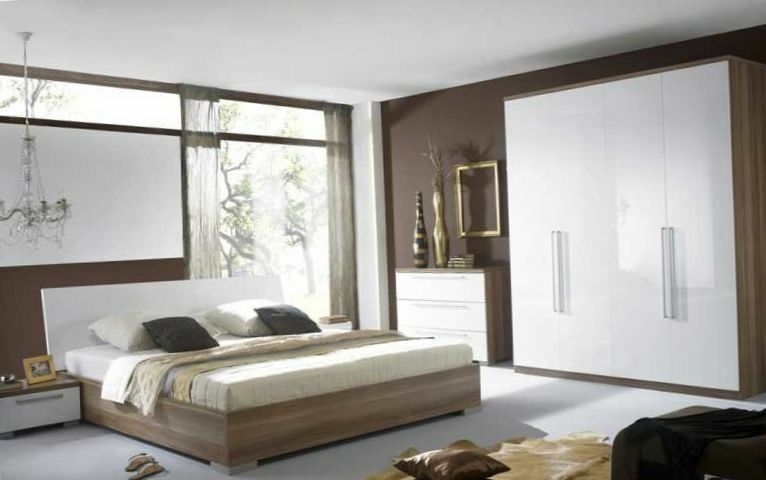 Wooden wardrobes design is traditionally mirrored and lacquered fab furnish furniture with 3-4 sections and multiple doors covering drawers and racks inside. 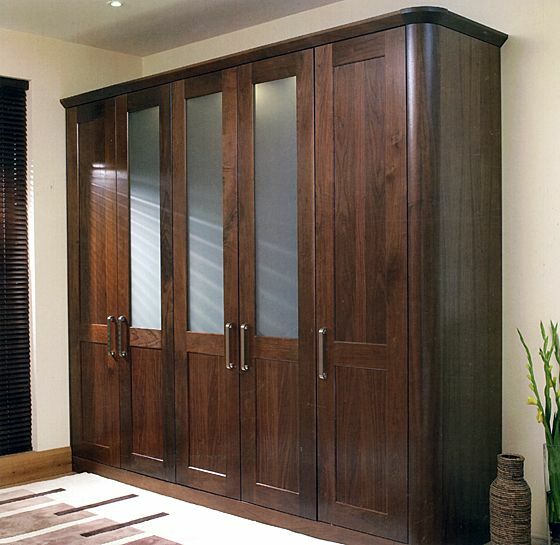 Built in wardrobes became very popular in the last time and still are highly demanded. The main reason is because people are thinking about and prefer more ergonomic and optimized solutions in their interiors. 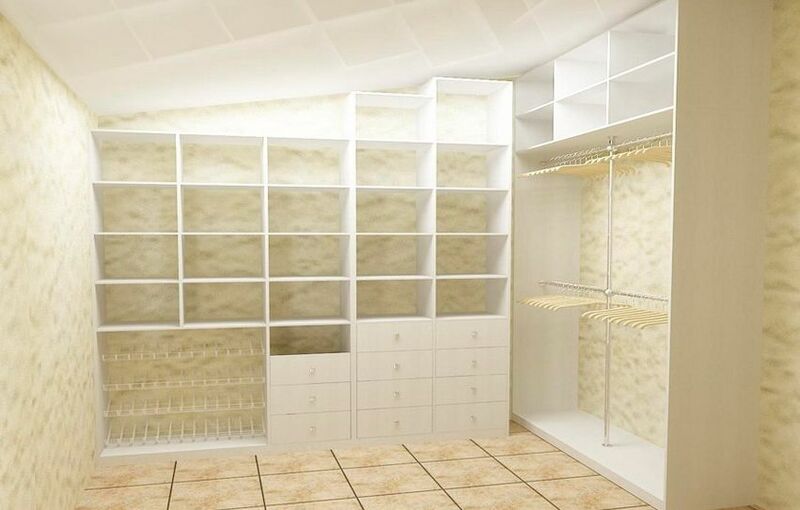 Implementing such wardrobes design can significantly help you to release a lot of additional storage space. It can be very deep inside or a bit shallower than a standard one that has cloth rails as well as other internal components such as shelves. 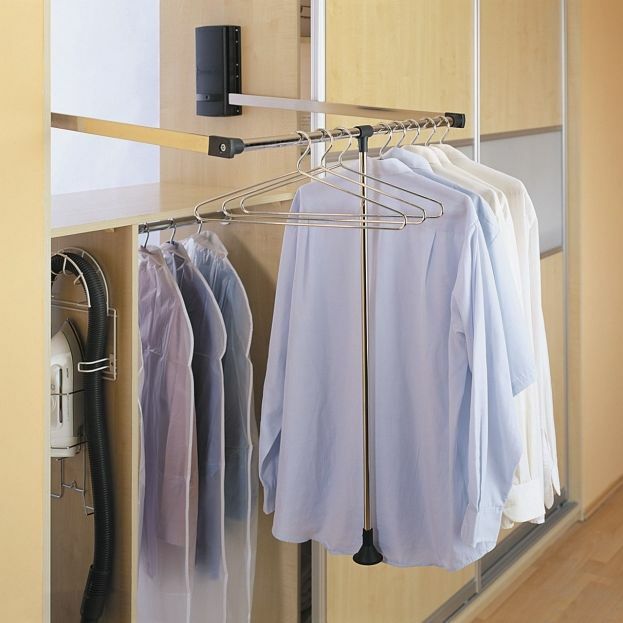 The main point here is how much space your room can provide for a fitted wardrobe. You might also want to take a look at bedroom design ideas to better match the common style. 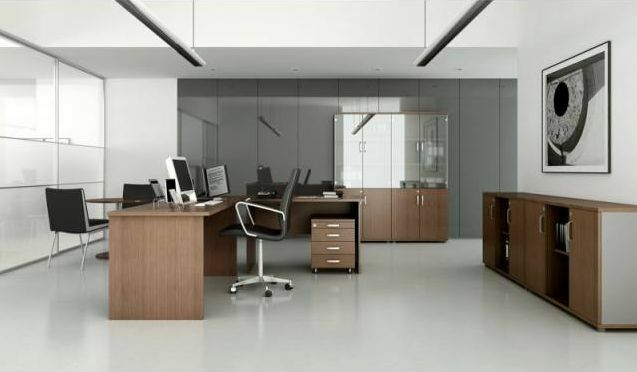 Office furniture shouldn’t be designed only for business needs but also to be a pleasure to work with. Main features for office storage is effectiveness and comfort. You shouldn’t waste time searching for whatever you might suddenly need, especially when you are in a hurry or get inspired with wonderful idea. Once your office storage organizes and sorts all the things you work with, then it definitely means you can fully dedicate your time for your effective work only. White minimalist furniture can be very attractive. Clean and simple look of white wardrobes design seems like it is almost melt into the wall, especially if there are no color and contrast differences between wardrobe and its background. 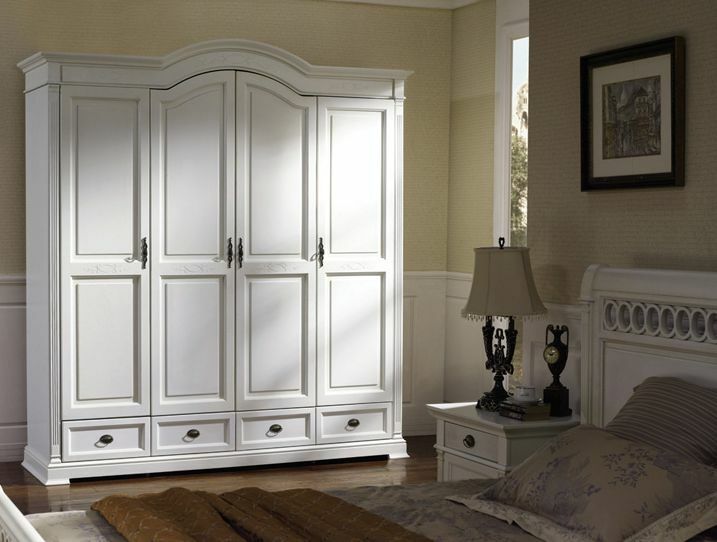 White bedroom wardrobe cabinets add amazing feeling to your living space, while successfully carrying out its main purpose – to store various clothes and other accessories. White is a very useful and pleasant design color and it can be easily combined with any other color that is a big advantage. Also take into account that while being so universal, it can bring minimalist look and improve the general impression of the room space, making it visually limitless and wide. Using wardrobes in whiter and lighter tones makes interior dark colors brighter and also brings a minimal look for rooms having lighter tones. When planning your wardrobe design, it is extremely necessary to choose supplementary wardrobe accessories in order to put your everyday clothes and off-season attire, shoes, ties, bags, etc. in order and keep well structured, organized and easily accessible. Below you can find some widely used and most creative wardrobe accessories (i.e. 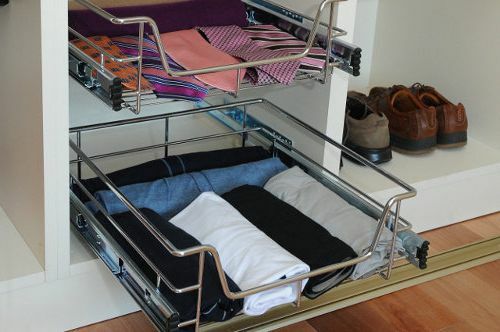 pull out baskets and pull down rails, internal drawers, storages with compartments, wire baskets for shoes, etc.) using which will help you to customize your wardrobe in the most unique and perfect way. Posted on June 28, 2013 September 9, 2013 Categories Wardrobe DesignLeave a comment on Wardrobe Design: 8 wonderful ideas to inspire you!